That USB port is used for more than just supplying power and PS3 status tracking – it’s also an interface to your PC. With Windows software downloaded from Audio Authority’s site, the BlueBeam can be custom configured and have its firmware updated. The adapter uses standard Windows system drivers, so no manual driver installation is required. The configuration utility has a simple interface with four main tabs. 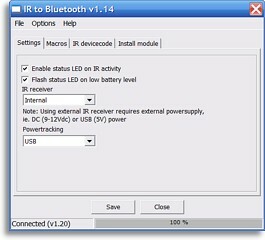 The first tab contains basic setup options, such as selecting whether the front status LED should flash to indicate command activity, whether to enable or disable the low battery level warning, and which of the power tracking options to enable. You can also select between using the internal IR receiver, or the external wired IR jack. 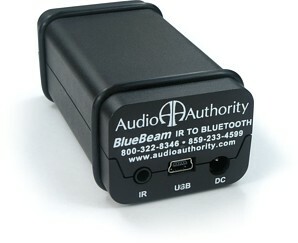 The BlueBeam is not actually compatible with most wired IR systems, and requires a demodulated 5 volt IR system (such as Audio Authority’s own extended IR receiver); however this limitation is expected to change in the future. The second tab offers macro configuration. Ten macros can be triggered on the BlueBeam, each with up to 8 commands. Every step can have a custom hold time (such as when you need to hold the [PS] button for a few seconds), plus a subsequent delay. 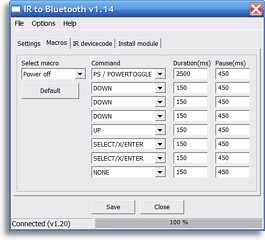 One of the macros corresponds directly to the discrete [Power Off] command, while the 9 others utilize custom IR codes for triggers. The third program tab is used to configure the BlueBeam’s infrared codeset. Four stock choices are available, including the standard Sony DVD with PS2 extensions that most of these adapters use, plus official Sony DVD player codesets 2, 3 and a codeset used for Sony portable DVD players. But what’s more interesting is the “Custom” option, which allows the BlueBeam to respond to absolutely any valid Sony device number. With nearly unlimited possibilities there will never be a conflict with a Sony DVD player, but as the special PS2 commands mappings are not changed from their default assignments it won’t be possible to run multiple adapters in the same system. The BlueBeam is preconfigured in the Logitech Harmony database, including the primary alternate codeset. Audio Authority additionally offers a basic Pronto .CCF file with the standard codeset; additional codes are not supplied and need to be generated manually. The fourth and final tab is for uploading “modules” to the adapter. No modules were available at review time, but the idea is to extend or improve the BlueBeam’s capabilities as new needs are discovered. Plus as mentioned the BlueBeam can always have its firmware (and the Bluetooth radio’s firmware) updated easily by the end user, so if anything changes in how the PS3 operates (not out of the realm of possibility) then the adapter will be fully upgradeable. Pairing the BlueBeam with the PS3 is an easy operation. First, remove all power from the adapter and then select remote registration on the PS3. When the console is ready, re-apply power to the adapter. The red status LED will blink slowly, indicating that it’s ready for pairing. Press and hold the  button on your remote for a few seconds or until the PS3 finishes registration. Done! A printed quick-start guide is included with the BlueBeam, while an extended manual in PDF format can be found on Audio Authority’s website, along with the software and other files. Technical support is available via a toll-free number, and the unit is backed by a 1 year warranty.